We generally don't think of a hearse as a great platform for customizing, but then again, we've never known Galpin Auto Sports to shy away from messing with anything on four wheels. That's why we weren't surprised to see this specially-built conveyance of corpses constructed by the Southern California customizer. The hearse features a Halloween theme including dozens of hand-painted skulls on the front and side, as well as a spiderweb grille. It's not all spooky, though, and Galpin has made the interior an inviting place to be, with a working barbeque, chilled cooler, and a flatscreen TV all in the coffin. Not a bad place to spend your last few hours above ground! Tricked-Out Treat! 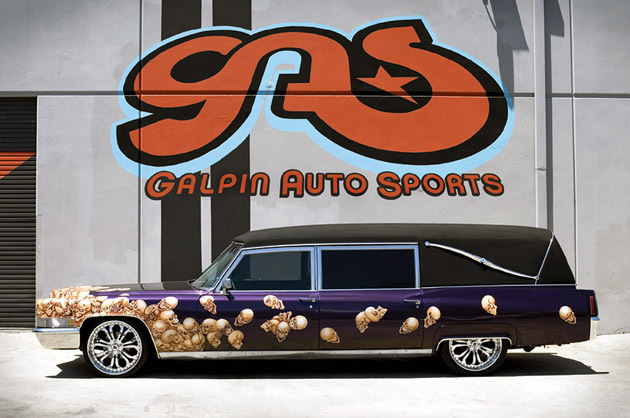 Galpin Auto Sports builds Halloween-themed hearse originally appeared on Autoblog on Sat, 31 Oct 2009 19:56:00 EST. Please see our terms for use of feeds. Anyway, snap out of it, because that ain't happenin'. We think what's likely to happen, if people go as batsh*t crazy over this creation at SEMA as we think they will, is that Lingenfelter will probably offer the package to customers. That's probably good, anyway, as we can't see GM spending the bucks to offer the 455 T/A's upgraded interior (yeah, it's premium vinyl, baby) and monstrously-upgraded engine. See, that 455 nomenclature's no joke. According to C/D, the 455 CID/7.5-liter V8 rocks an 11.5:1 compression ratio, ported and polished LS7 heads, a new intake and a forged crankshaft. The exhaust is by Corsa, the honeycomb wheels are custom jobs, and most importantly, the engine comes correct with 655 horses and 610 lb-ft. of torque. We'll have plenty more on this bad mofo next week from SEMA. In the meantime, head over to CarandDriver.com for more images. 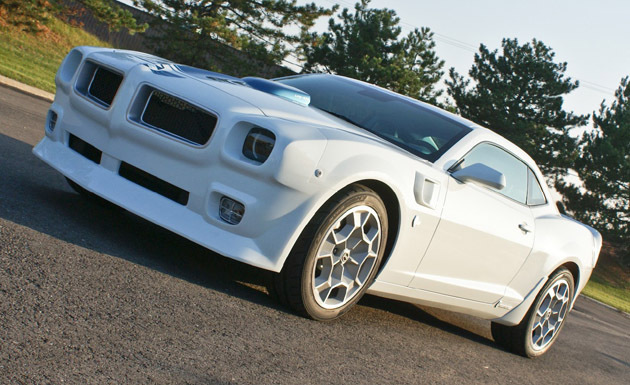 The Lingenfelter 455 T/A Concept really is badass originally appeared on Autoblog on Sat, 31 Oct 2009 18:07:00 EST. Please see our terms for use of feeds. Do you remember back in 1996 when Michael Schumacher left Benetton for Ferrari? They didn't just get Schumi; along with him came master strategist Ross Brawn and designer extraordinaire Rory Byrne. Together, the wonder team built the Scuderia back into a championship-winning powerhouse. Well, we have a feeling there are some people in Maranello who may be getting acquainted with the flip side of that particular coin. Following the appointment of Dany Bahar - who left his position as Ferrari's senior vice president of marketing - to the post of chief executive at one-time rival Lotus comes news that the British engineering firm has scored Claudio Berro as its new director of motorsport. Although Berro hasn't been at Maranello for a few years now, he's a well-known personality in Italian motor racing. Not unlike his successor Jean Todt - recently elected president of the FIA - Berro started out as a co-driver for the Peugeot Talbot rally team before kicking off an impressive career as a team manager. Before going on direct the ill-fated Speedcar Series in the Middle East, Berro headed up racing operations for Ferrari, Maserati, Alfa Romeo and Abarth individually, and then the entire Fiat Group, managing the industrial empire's F1, GT, touring car and rally teams. 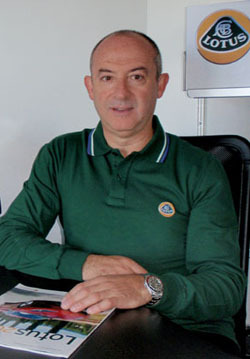 Now at Lotus, Berro will be responsible for implementing the return to racing that Bahar recently outlined. However, his role with the Malaysia-based Lotus F1 team remains to be seen. Details in the press release after the jump. Lotus hires former Ferrari/Fiat racing chief Claudio Berro as new motorsport director originally appeared on Autoblog on Sat, 31 Oct 2009 17:34:00 EST. Please see our terms for use of feeds. Ford Motor Company and the leadership of the Canadian Auto Workers union have reached a tentative agreement after a marathon four-day wrap-up to negotiations. Union membership needs to approve the deal, which will guarantee a Great White North presence for Ford until at least 2012. Voting is underway this weekend, and if approved, the CAW will be responsible for building 10 percent of Ford's North American production, down from the current 13 percent, which the union had been trying to hold on to. Workers did agree to time off reductions, and pledged that new employees will have to pay into their pensions. Ford's given its word that the company will build as many vehicles in Canada as it sells there, and the union deemed the pledge good enough to grant GM- and Chrysler-style concessions to Ford. The Panther platform has been given its last rites; the St. Thomas Assembly plant is the only Ford location currently building the body-on-frame biggies, and that plant will close in September 2011. The 1,600 people in Ontario who build Town Cars and Grand Marquis are understandably unhappy about word that Ford intends to shutter the plant, but the Panther has cheated death more than once. This time, it may stick. Better news for CAW members is that Ford's Oakville assembly complex, also in Ontario, has the go-ahead to add a third shift when needed. Ford also says it will manufacture a new vehicle at Oakville, which currently builds the Edge, Flex, MKX, and MKT crossovers, but that will likely come after the current labor agreement expires. 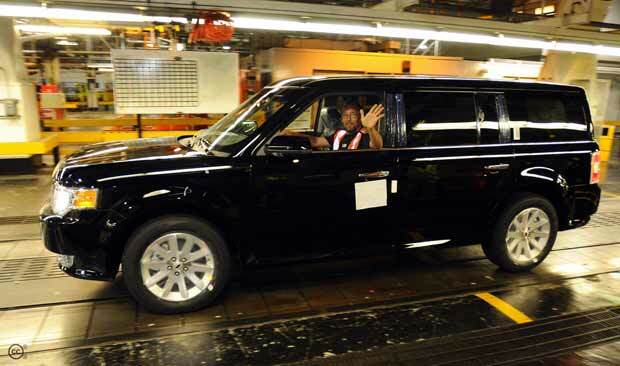 Ford and Canadian Auto Workers reportedly reach a deal originally appeared on Autoblog on Sat, 31 Oct 2009 16:09:00 EST. Please see our terms for use of feeds. It's official: Scion is headed to the land of Bob and Doug. Toyota's sub-brand will arrive in 45 dealerships in Montreal, Toronto and Vancouver ten months from now, in September 2010. Scion's full model range will be offered -- xB, xD, and tC -- and dealers will present them in a "store within a store" concept, which makes it sound like passwords, burlesque, and moonshine will be involved. 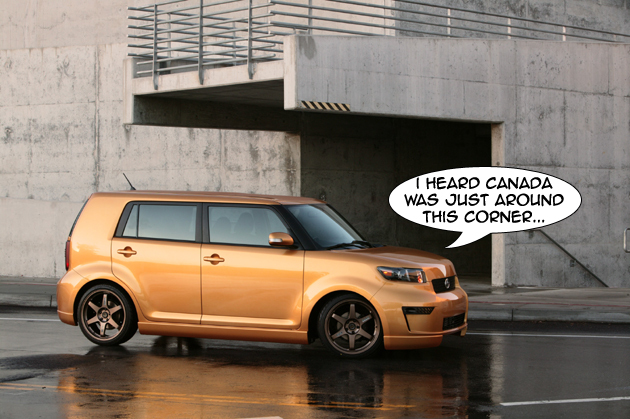 To give you Canuck Scion mavens something to do for the next eleven months, there's a Canadian Scion website. It's a little barren right now, but after you take a quick survey it'll let you know things like the Scion badge was "created to symbolize non-conformity, authenticity and personal style." And then there are links to other Scion content, such as an interview with Motörhead, because what Scion owner doesn't love Lemmy? Canadians rejoice. Eh. Hat tip to Luc! Scion brand finally headed to Canada next September originally appeared on Autoblog on Sat, 31 Oct 2009 14:18:00 EST. Please see our terms for use of feeds. NASCAR's rollout of its new Nationwide Series race car design has garnered buzz already with the introduction of the first-ever Mustang-branded stocker, and it got another shot in the arm yesterday at Talladega when Chrysler pulled the wraps off its brand-new Dodge Challenger Nationwide racer. We personally love the fact that the Challenger NNS car retains the same general front-end look as the production street car -- partially restoring an element that's been missing from stock cars for years now. The new Nationwide Mustang and Challenger will join their yet-to-be-unveiled counterparts from Chevy and Toyota (don't hold your breath for a Nationwide Camaro) in four races on the 2010 Nationwide Series calendar: Daytona in July, then later dates at Michigan, Richmond, and Lowe's Motor Speedway. The new car designs are expected to be fully adopted for the 2011 NASCAR Nationwide Series season. This process mimics the way NASCAR rolled out the Car of Tomorrow in the top-tier Sprint Cup series. Check out Dodge's official press release after the jump, and have a closer look at the new Dodge Challenger Nationwide car in the gallery below. As soon as Chrysler PR uploads photos that show more than just the car's front end (come on, guys...), we'll update the gallery. UPDATE: NASCAR.com has shots of all four new NNS cars. The Chevy and Toyota retain Impala and Camry branding. 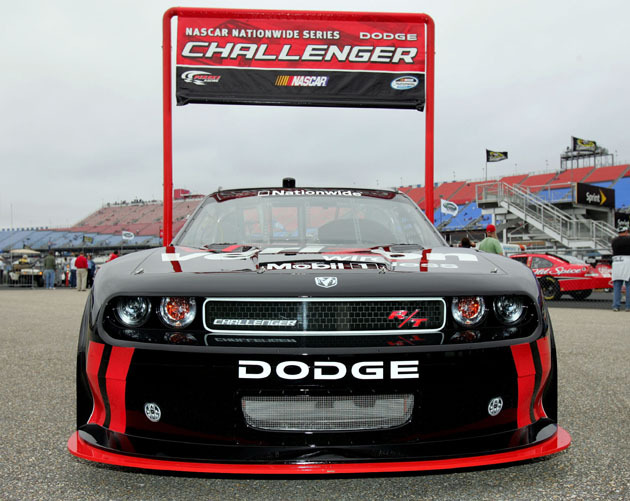 Dodge Challenger NASCAR Nationwide Series racer unveiled originally appeared on Autoblog on Sat, 31 Oct 2009 12:24:00 EST. Please see our terms for use of feeds. James Norwood was hired on at Old Mill Toyota in Omaha, Nebraska in 2000, eventually working his way up to parts and service director. At the same time, Norwood reportedly sold over $548,000 in goods as a hard-working eBay business owner, praised by customers for being dedicated and a fast shipper. Norwood sounds a lot like a man living the American dream, except prosecutors in Omaha allege that the entrepreneur has been stealing parts from his day job to sell on eBay. The Omaha World-Herald reports that Norwood has officially been charged with theft, a crime punishable by up to 20 years in prison. 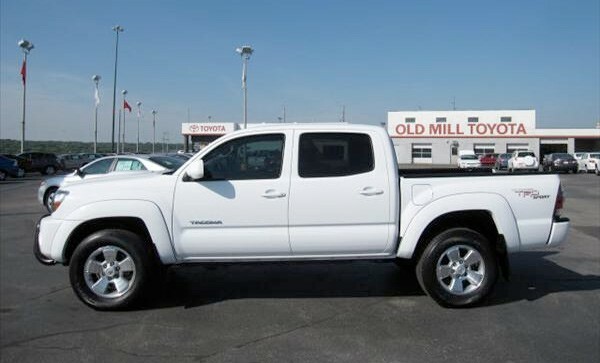 Old Mill Toyota became suspicious of Norwood's actions when a co-worker allegedly witnessed him creating fictitious parts tickets using other employees' names and then later canceling them so the body shops weren't charged. Prosecutors also claim that Norwood would help his co-workers unload the parts truck, creating a separate pile of items that were intended for auction. REPORT: Omaha Toyota dealer employee accused of selling $282,000 in parts on eBay originally appeared on Autoblog on Sat, 31 Oct 2009 10:47:00 EST. Please see our terms for use of feeds. Those punk kids who TP your neighborhoods and smash pumpkins on mischief night? Rank amateurs. If you want to do something, do it right - an idea that Conan O'Brien clearly has a handle on. 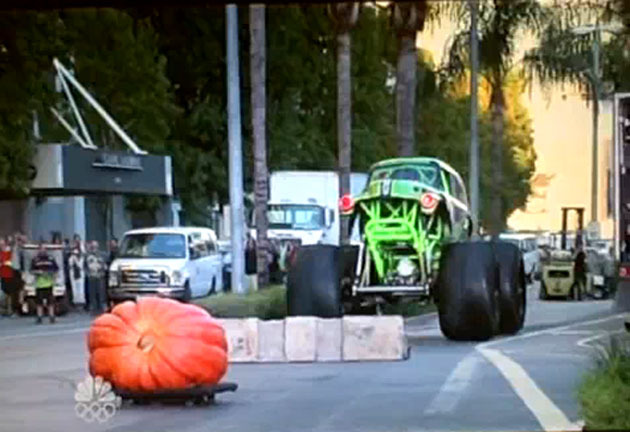 Hence, when it came time to smash a pumpkin on The Tonight Show, he procured the world's largest, and the blunt instrument he calls upon to do the smashing is Dennis Anderson's Grave Digger. You all know how this ends. The video's posted after the jump. Thanks to Shawn for the heads-up! Happy Halloween from Autoblog originally appeared on Autoblog on Sat, 31 Oct 2009 09:13:00 EST. Please see our terms for use of feeds. We've seen the pictures. We've seen the videos. Now we're finally going to see the Hennessey HPE700 Camaro in person when it makes its official debut at SEMA next week. There's a lot to love with Hennessey's halo musclecar, starting with the LS9 V8 from the ZR1 packing 725 horsepower and 741 lb.-ft. torque (up from the initial figures, 705 and 717 respectively). Those numbers are good for a 0-60 time of just 3.5 seconds, and the trip back to a complete stop takes just 104 feet thanks to 15-inch Brembo brakes. Then there's the subtle Cam-Aero carbon fiber body kit that adds a front splitter, side skirts, rear bumper, and a diffuser, with the look is finished off with a set of Hennessey's three-piece, 20-inch wheels. Expect plenty of photographs and our first person impressions when we come face to face with the HPE700 Camaro next week. Until then, check out the new high-res photos in the gallery below or read the official press release and the full specs list after the jump. 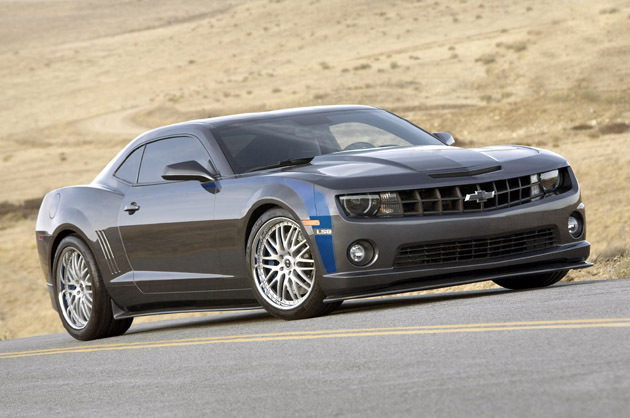 2010 Hennessey HP700 Camaro to make official debut at SEMA originally appeared on Autoblog on Fri, 30 Oct 2009 20:01:00 EST. Please see our terms for use of feeds. If you've been following the dust-up surrounding Honda's 2010 Accord Crosstour, you might therefore assume that Wednesday's announcement that the company plans to bring over its European-market Accord Tourer may have been motivated in part by early online reaction to the forthcoming five-door crossover. But as we suspected, t'aint necessarily so. The Accord Tourer will hit U.S. shores later next year branded as the Acura TSX Sport Wagon, and as just about anyone in automotive product planning will tell you, new models aren't conceived that quickly - even if the vehicle in question is just a simple porting-over job from another market. There are emissions and crash-test certification hoops to jump through, suppliers that need to be contracted, dealers that need to be trained and marketing strategies that need to be built. As spokesman Chuck Schifsky tells Autoblog, "Honda, as you know, is about as fast a reacting a product planning company as there is, but we don't react that quickly!... If our past is any indication, then us announcing the TSX wagon at this point shouldn't have been a surprise - we're notoriously known for bringing out a car and having it arrive in showrooms not long afterwards." Indeed, Schifsky is right - vehicles like the third-generation CR-V were seemingly in dealers within weeks of the public announcement and press launch. That said, Schifsky did admit that the timing of the announcement was moved up slightly for "strategic reasons," but he also said that those reasons had nothing to do with the Crosstour. We asked Schifsky what the TSX Sport Wagon will look like when it arrives, and he told us that the car will not simply be the same as the European car. He admits he hasn't seen the finished product for himself yet, but he acknowledges that changes will be made to bring the design in-line with Acura's current styling language (read: it will receive a variation of the love/loath shield grille), and equipment levels will change to meet U.S. expectations. Given how much effort and money has been expended developing Acura's new corporate face, he believes it would be "foolish" to bring the Accord Tourer as-is, simply swapping the Honda badge for its Acura counterpart. Says Schifsky, "I would look to the U.S. TSX as an indicator as to what kind of equipment the car will have." Further, he advised us to examine the differences between the European-market Accord sedan and the Tourer bodystyle to look for indicators of what sort of changes the American market wagon will likely receive. It's too early for Honda to reveal pricing for the 2011 model, but as the current TSX sedan starts at $29,310 and the 2010 Crosstour's price figures to be above a Accord V6 sedan (base price: $26,805), it's likely that there will be significant pricing overlap between the two models. Will there be any cannibalization? The Crosstour should lay claim to superior space and foul-weather capability thanks to its all-wheel drive model, but if the TSX sedan is anything to go on, the Acura will have superior driving dynamics, closer-to mainstream looks and a more desirable badge. 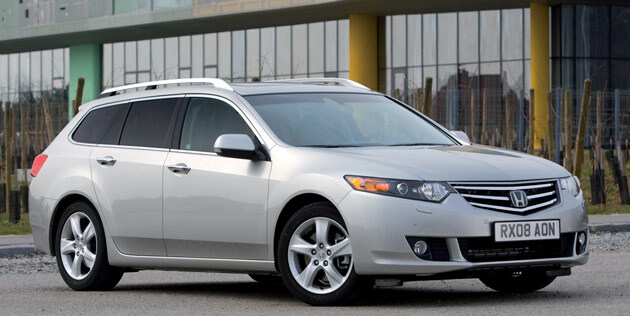 U.S. Acura TSX Sport Wagon not motivated by Honda Crosstour feedback originally appeared on Autoblog on Fri, 30 Oct 2009 19:26:00 EST. Please see our terms for use of feeds.